Raj Nair: "How much better than a human driver does the system need to be for us to feel comfortable putting it into thousands of vehicles?" Ford Chief Technical Officer Raj Nair says he will be first in line when autonomous cars go on sale. A big fan of autonomous driving, Nair believes the two biggest issues slowing its rollout are sensor capability and developing software that can read the road like a human would. 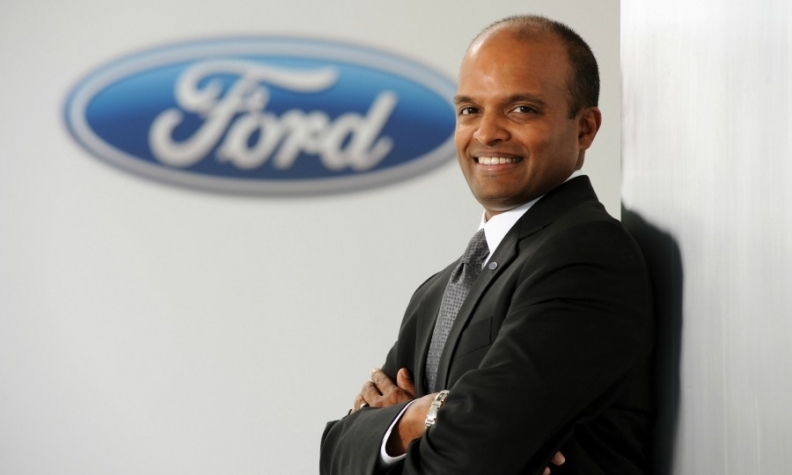 Nair has global responsibility for all aspects of Ford's design, engineering, research and product development and has been with the company since 1987. He was interviewed by Automotive News Europe Editor Luca Ciferri in January at the CES in Las Vegas. How soon will fully autonomous vehicles go on sale? I think it is credible that an autonomous vehicle at SAE Level 4 [one step below full automation] will hit the market by 2020. Level 4 means operating in some type of geo-fenced area when the weather conditions are conducive to the type of sensors we're using. From a technical standpoint what are the big problems to solve? There are two we are focusing on: software algorithms and sensor capability. The human body is an amazing array of sensors – two great optical sensors, auditory sensors and balance sensors that provide information that the brain doesn't only perceive but also filters. To reproduce all of that with a combination of lidar [3-D laser scanning], radar and ultrasonic sensors is a big challenge. Then there are the algorithms. They are reasonably straightforward for the basic aspects of driving. If you can see the white lines it's not that hard to steer the vehicle between them. But for all the other things that your mind works through when driving, you need to be prepared for all of them. This increases the level of sensor capability processing you need. So greater sophistication increases the challenge? Yes, a lot. It's almost like going up an exponential scale. To get to the first portion is not that hard but with every percentage above it you’re going up exponentially in terms of sensors and processing capability. You also have to ask how far up that scale do we need to be – forgetting the regulatory aspect – for our own comfort as a manufacturer? How much better than a human driver does the system need to be for us to feel comfortable putting it into thousands of vehicles? From Level 4 in a protected environment to a car that can go from one city center to another city how much more time do you need, another five years? I think it depends. The reason we say a geo-fenced area, and let's put the weather aside for now, is for some of the advanced aspects. We really need exact positioning of the vehicle and to have the vehicle reference itself to a known map. That makes some of the sensing a little bit easier. If you know that an image, based on previous mapping, is a fire hydrant then you don’t need to consider whether it is a fire hydrant or a small boy. The reason we need a geo-fenced area is because that type of laser mapping is very intensive. It can be done for a big urban environment, but it is an intensive effort. If you were to provide laser mapping for a highway connecting two cities as you mentioned, then even Level 4 would be capable of that. But if you want to go out on a dirt road or somewhere not previously mapped and expect the vehicle to be able to deal with all the possibilities that could happen – a cow running across the road for example – that's a challenge for Level 5. I've heard Level 4 equated with the brain of a 4-year-old boy. Do you agree with that? I'm not the expert on how smart a 4-year-old child is. But I can tell you that the processing capability of even a 4-year-old human brain is pretty impressive. And if you think about how much processing capability it takes to even catch a ball, there's a lot of math that goes into that, and yet a little 4-year-old boy can catch a ball. Mother Nature has engineered an incredible biological mechanism that we as mere human engineers are trying to create mechanically and electronically and that's a challenge. driving systems into thousands of vehicles. Does connected car require high-resolution digital mapping or not? Our view in the medium timeframe we’re talking about is yes, we need high-definition digital maps. That comes from Google and not many other providers, right? No. There are quite a few mapping companies and one of them has just been bought by a German alliance [Last December BMW, Audi and Daimler purchased Nokia's mapping business, HERE]. In some of our vehicles with lidar systems we’ve been mapping as well. We haven't decided whether we will source maps from a partner or develop them ourselves. Does it make more sense to buy or license them? I think everybody's kind of starting from the same spot as far as developing the high-definition maps we’re talking about. It's not enough to have the GPS maps everybody has now. It's not even enough to have Google Street View. You have to go out and do the work. We haven't determined what the right direction is yet. Does the world need to be remapped for autonomous driving and how much does it cost per mapping mile? For the technology as we see it and within that four-year timeframe, yes. As regards costs, I don't have an estimate. Eventually we foresee an environment where the vehicle is not only referencing itself to a map but is also updating that map as it's driving. Right now the GPS system in a vehicle car has an error factor of about 1.2 meters. Is that good enough for autonomous driving? No. We need to be able to reference what the sensors are seeing right now against an existing laser map in order to understand exactly where we are. We are already getting pretty good precision from GPS as it is, but even its maximum capability won't be enough to really deliver Level 4 autonomy. What is the key to connected cars? The user experience. We used to talk about connectivity as an individual remaining seamlessly connected when he was driving and that was the basis of Ford SYNC. Now we're talking about connectivity as a vehicle being just one of the devices on the Internet of Things. As such it needs its own connectivity and that's what SYNC Connect has - a 4G LTE connection to the vehicle itself. This creates a lot of capability and possibilities. Our recent announcement of partnerships with Amazon and Echo and Alexa is just the start. With Alexa you can be in your house and say, 'Alexa, please start my car. Alexa, what's the range of my vehicle?' And on the way home you can say, 'Alexa, open the garage door. Alexa, please turn on the TV or change the temperature to 70 degrees.' These features are not just about technology for technology's sake, but about making people's lives better and easier. When do you expect this technology to be available? We’re talking about this year.